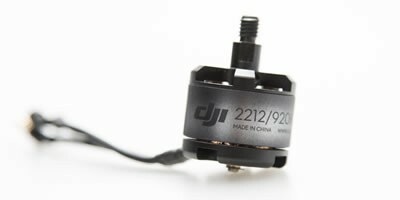 The DJI E300 motor is a replacement motor for the E300 Tuned Propulsion system. The E300 Motor & ESC's are the first power solution designed for multi-rotor use, the higher thrust to weight ratio from the E300 system increases the reliability, stability and agility of flight through enhanced aerodynamics and efficiency from the motor and propeller combination. The E300 motors are designed to work with the Tuned Propulsion system and the recomended propeller to use is the 9.4 x 4.3 with the E300 motors which deliver an average of 20-25% improvement over the 8 x 4.5 propellers without the need for an increase in motor size. The higher lift generated from the new profile propeller means that payloads can be increased without the need to upgrade the system. Once again BOYD has come up with the goods. These motors are no longer made but the lads manage to dig up two for me out of his vault plus a couple of other parts that no longer being made. Great bunch of staff and always willing to help no matter what you put before them Thanks again and keep up the fantastic service, none better. Ian Mallett. These motors are simple and cheap, and work very well. Together with the matched ESC and prop they are very efficient, easy to use and provide excellent flying time and response. as the ESCs are essentially custom configured for this motor they never lose sync and only get warm if used max throttle with 4S. Service from BYOD is superb as always. There was a mistake with the order (CW instead of CCW) and I got the correct motor delivered the next day. Excellent.